The Court said that whatever documents that could be legitimately produced in public domain should be given to the petitioners and all other documents covered under the Official Secrets Act should be given to the Court in sealed cover. The CJI-led bench of Supreme Court asked the Government to submit before the Court the pricing and strategic details of Rafale deal in sealed cover within 10 days. The Court expressed that it "would like to be apprised to the details with regard to pricing/cost, advantages thereof, if any, which will be submitted in a sealed cover". On October 10, the bench had sought from the Attorney General the details of the steps involved in the decision leading to the new deal. 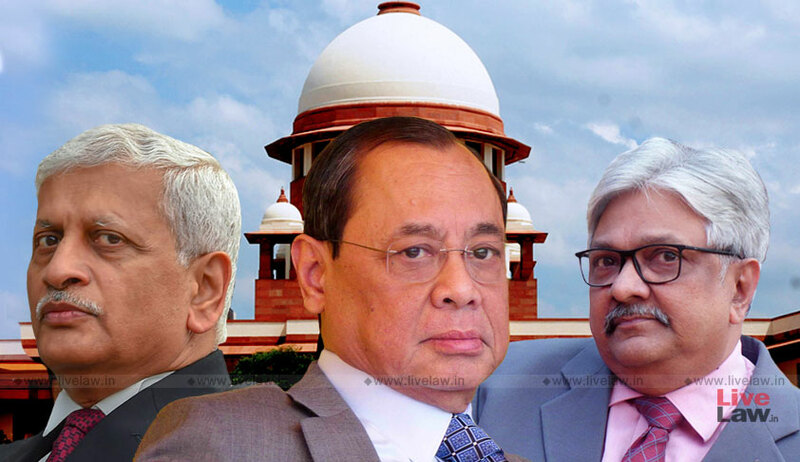 The CJI led bench had then clarified that the details so sought would not cover the pricing or the suitability of the equipment for the Indian Air Force, bearing in mind the sensitive nature of the matter. But in a change from the earlier stance, the Court today sought for pricing and strategics as well. Today the bench allowed the contents of the note giving the details of the steps in the decision-making process leading to the contract for 36 Rafale jets to be furnished to the Counsel for the petitioners and the petitioners-in-person. The Chief Justice remarked, “we have gone through what had been given to us. Mr. Attorney, Mr. Solicitor, we are proposing to pass an order. Please listen to us carefully”. "At this stage, we would not like to record any finding or views with regard to the contents of the said report. Rather, we are of the opinion that such of the core information conveyed to the Court in the aforesaid confidential report which can legitimately be brought into the public domain be made available to the learned counsels for the petitioners in all the cases, as well as, the petitioners-in-person". "Along with the said facts, further details that could legitimately come in the public domain with regard to the induction of the Indian offset partner (if any) be also furnished to the learned counsels for the parties, as well as, the petitioners in person". "Such of the details in this regard which may be considered to be strategic and confidential may, at this stage, be placed before the Court and may not be furnished to the learned counsels for the parties or the petitioners-in-person. The Court would also like to be apprised of the details with regard to the pricing/cost, particularly, the advantage thereof, if any, which again will be submitted to the Court in a sealed cover. The necessary information/particulars be communicated to the learned counsels for the parties and the petitioners-in-person, and the rest of the details in terms of the present order be submitted to the Court in a sealed cover in the next ten days. The parties may file their response to the information that would be conveyed", ordered the Court. The Attorney General objected to sharing of details of the deal including its pricing, by stating that it would be covered under Official Secrets Act. Considering the objection, the Court said that whatever documents that could be legitimately produced in public domain should be given to the petitioners and all other documents covered under the Official Secrets Act should be given to the Court in sealed cover. Further, the AG advanced that the details of Pricing have not even been laid down before the Parliament. “If pricing is something exclusive that you are not sharing, file an affidavit to that effect. State on affidavit that you cannot furnish those details”, said Chief Justice Gogoi. Also listed today was the PIL filed by former Union Ministers Yashwant Sinha and Arun Shourie, along with lawyer Prashant Bhushan, for registration of FIR and Court-monitored investigation by CBI into corruption allegations in Rafale deal. When Prashant Bhushan pressed for CBI probe, the CJI replied " For CBI probe, you have to wait." The matter has been adjourned to November 14. The PIL alleges that in the Rafale deal there is prima facie evidence of commission of cognizable offences under the Prevention of Corruption Act by public servants occupying the highest of public offices in the country. Though the petitioners had filed a complaint on October 4 before the CBI alleging foul play in Rafale deal, no action has been taken. It is alleged that "non-registration of FIR is apparently on account of the fact that the complaint pertains to corruption in the procurement for 36 Rafale aircrafts by the highest public servants in the country and there is extreme pressure on the CBI due to which it is unable to discharge the duties cast on it in a fair and impartial manner". According Sinha, Shourie and Bhushan, in 2007, after going through the requisite procurement procedures at various levels, tenders were issued by the Ministry of Defence for the purchase of 126 fighter aircrafts and it was specified in the Request for Proposal that 18 of these aircrafts would be purchased from abroad in a ‘fly-away’ condition and the remaining 108 would be manufactured in India in the factory of Hindustan Aeronautics Limited (HAL) with transfer of technology from the foreign vendor. After the financial bids, Dassault Company manufacturing the Rafale aircraft was declared the lowest tenderer and thereafter price negotiations began. These negotiations were at a very advanced stage (95% complete) by 25 march 2015, states the petition. However, when the Prime Minister visited France in April 2015, a new deal was announced to purchase only 36 Rafale Aircrafts in a ‘fly-away’ condition without any transfer of technology and make in India. It later turned out that the new deal involved 50% of the value of the contract to be given as “offset contracts” to Indian companies and that the government informally told Dassault and the French government that the bulk of the offset contracts would have to be given RAL company of Mr. Anil Ambani which had just been set up. It is also alleged that the price of the aircrafts in the new deal has been increased from approximately 700 crores per aircraft to over 1600 crores per aircraft without any legitimate public interest. This act of unilaterally changing the deal by bypassing all laid down procedures was to ensure that Mr. Ambani could be brought in as an offset partner for the purpose of obtaining for him offsets worth thousands of crores, alleges the petition. "Mr. Anil Ambani’s recently incorporated company had no credibility or even eligibility to be an offset partner for Dassault. That therefore, the thousands of crores to be received by RAL through the offset contract are substantially in the nature of commissions", the petitioners submit. It is also stated that the French government as well as the Dassault Aviation company were told that this contract of 36 ‘ready to fly’ aircraft will be only given to Dassault Aviation, if they gave the major part of the offset contracts in this deal to Mr. Anil Ambani’s company. The petitioners allege that the new deal was unilaterally announced without following any mandatory procurement procedure of the Defence Ministry. The new deal gives undue benefit to Reliance Aerospace Limited(RAL), and the escalation of price of airplanes is to account for collateral considerations, alleges the petition. This would amount to "Criminal Misconduct" under section 13(1)(d)(ii) of the Prevention of Corruption Act, as applicable on the date of commission of offence. It is further stated that "public servants presiding over the government got the critical persons involved and Contract Negotiation Committee to increase the contract price of the 36 Rafale aircrafts from Rs. 715 crore per aircraft as disclosed by Mr. Parrikar to Rs. 1660 crore per aircraft. This resulted in a pecuniary advantage to both, Dassault Aviation and also Mr. Ambani’s RAL This amounts to Criminal Misconduct under section 13(1)(d)(iii) of the applicable Prevention of Corruption Act". The petitioners state that their complaint filed before CBI on October 4 reveal commission of congnizable offences under PC Act, and the CBI was bound to register FIR and carry out investigation as per the dictum of Constitution Bench in Lalitha Kumari case. Even no preliminary enquiry has been initiated till date, laments the petition. Therefore, the PIL seeks to direct CBI to register FIR and initiate probe into the deal under the supervision of the SC. It also seeks to direct the Central Government to to cease and desist from influencing or intimidating in any way the officials that would investigate the offences disclosed in the complaint. The CBI officials handling the investigation should not be transferred or taken off charge and they should submit periodic status reports before the SC regarding the probe, prays the petition.